Address: 5/F Block 3,Penghua Industry Park,East Heping Rd,Longhua town,Bao'an, Shenzhen, Guangdong, China. l Embedded intelligent algorithms for best viewing license plate day and night. l With electronic shutter speed, WDR, AGC, 3D DNR. 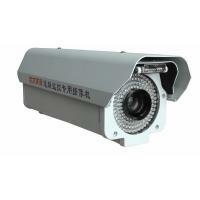 l Shutter speed: 1-3 lanes surveillance, 30KM/H, 60KM/H, 90KM/H,120KM/H, 150KM/H,180+ KM/H,etc. l Easy setting: no need professionals, no need client software. BNC video output on control board for connection with a monitor. Manual setting all the function on control board inside camera. Connect NVR or computer, playback video,pause and see license plates clearly. l With 2 section auxiliary lights. Luminance adjustable, 1-60M distance. If main auxiliary lights is not strong enough, 2nd auxiliary light can be light up. l LCD display: electronic shutter speed, HLC light inhibition value, WDR ON/OFF, AGC, 3D DNR,auxiliary light luminance value, input linkage and re-set. l In unusual circumstances auto reset the system to ensure the normal operation. Automatic reconnection when network interrupt. l 172pcs double color LED lights. Color image at night. Night vision distance <60 M. Luminance add+ / decrease-, adjustable even in daytime or at night. Auto shift from daytime setting mode to night setting mode. l SDK package support for 2nd development. l The camera can face strong headlight and see the object clearly under headlights. l Built-in temperature controlling devices. Less than 45 degrees inner case, longer lifetime. l IP66, waterproof,weatherproof, anti-fog. Built-in heater, cooler. Double thick shield housing. l Double glasses in the front of camera. Avoid halo and light spot when auxiliary light is on. ROI Yes. it can make clearer image of specified region of interest. Storage snapshot images snapshot JPEG images store in SD card (max.32G) and FTP server.